Canceling a Timeshare Contract in Florida - Cancel ANY FL Timeshare! Canceling a timeshare contract in Florida is a time-consuming, but not impossible task. There are many scenarios where one would be seeking ways to cancel a timeshare in Florida, but the following are the most common stories we hear from our clients. Scenario #1: One night while you’re having dinner, the phone rang. On the other end, a gleeful girl alerted you that you had won an all expenses paid three-day vacation at a wonderful hotel. All you had to do was enjoy yourself and endure a “short discussion” about chances to possess your very own slice of the resort to enjoy at will for the rest of your life. Excited to be able to get out of town for a weekend, maybe you gladly accepted, and got sucked into a whirlwind of enthusiasm that resulted in ownership of a timeshare you do not really want and likely can not afford. Scenario #2: You are enjoying a relaxing vacation at an amazing resort. You are approached by a strapping young lad, carrying a clipboard and wearing a polo shirt emblazoned with the resort logo. He warmly invites you to an exciting V.I.P. gala. You accept, attend and end up with the same result as described in Scenario #1. When you come to realize that you have made a life-altering decision by making this impulse real estate buy, reality sets in. You go over your monthly budget again and again. You fear that there is no way that you can continue paying for your timeshare. Perhaps you’ve enjoyed it for a few years, but are tired of going to the same place every year for your vacation. Perhaps you’ve lost your job, your kids are going to college or you physically are unable to visit your timeshare. Or worse, perhaps you’ve been hit with an assessment or fee increase that is crippling your personal finances. Whatever the reason, you are most likely wondering how to get out of a timeshare contract in Florida. So, how do you proceed? Is there a way out? There are steps you can take, but they are time consuming, stressful and may result in ultimate disappointment if you attempt them on your own. Step 1: Review your contract meticulously. Most timeshare mortgages have a right to rescind within a certain time period. According to the Florida Vacation Plan and Timeshare Act, new timeshare owners can rescind the contract any time prior to midnight on the 10th calendar day following the signing of the timeshare contract or the day the purchaser received the package of finalized documents, which ever is later. Your timeshare salesperson may or might not inform you regarding that provision at the time of sale. If you are even one day past the deadline cutoff, you will most likely not qualify for this protection. 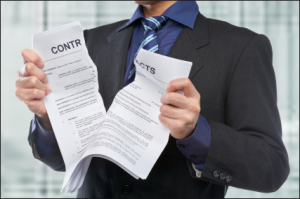 Step 2: Comply with the guidelines and procedures for rescinding your contract down to the letter. Adhere to the deadline as described in Step 1. As well, you must include the name and address of the seller in the letter of intent to rescind. This letter becomes effective as of the date that it is sent. after the investment for canceling a timeshare contract in Florida. You should send all the appropriate paperwork within that window of time in order to terminate a timeshare contract. Step 3: Use certified mail to send in your notice of rescission. Don’t take advantage of any shortcuts you may be offered, even if you are told that you can fax, e-mail or deliver the papers by hand. The only way to make sure the documents are received in a timely manner is through certified mail. In this way, you are assured that there is an adequate paper trail, indicating that the federal government (the U.S.P.S) acknowledges the exact date and time that you forwarded the rescission and a government entity obtained the recipient’s authorization that they did indeed receive the documents. Step 4: Send a certified letter to the timeshare company if you are beyond the rescission period and followed with a pleasant telephone call. State the reasons why you need to get yourself out of the agreement. The timeshare company should send you a refund in full of any payments you have already made. This refund must be made within 20 days after the seller received your cancellation notice or within five days after your purchase check clears, which ever is later. Step 5: See an attorney. When you signed your agreement, he may be able to discover or locate a loophole out if any of your civil liberties were breached. If not, he could have the ability to recommend an additional strategy to help you get out of the agreement. Step 6: If you think you were pushed or taken benefit of in any type of way, call the Better Business Bureau and your state attorney’s office. Step 7: If you are already beyond your allowable rescind period for canceling your timeshare contract in Florida, you should contact us as soon as possible at 1.888.743.9051. You may qualify for our Timeshare Redemption program, whereby our expert timeshare case managers will begin the timeshare transfer process freeing you from any further obligation. This is by far the easiest and most secure way to fulfill all the necessary paperwork for canceling a timeshare contract in Florida. Too Late to Cancel a Timeshare in Florida? If canceling a timeshare contract in Florida is no longer an option for you according to the Timeshare Laws of Florida, call us now for a Free Consultation. Redemption and Release, LLC can make your Florida timeshare cancellation exit strategy simple and cost-effective. Contact us today at 1-888-743-9051 or use our Online Contact Form to request free, no-obligation information about canceling a timeshare contract in Florida..